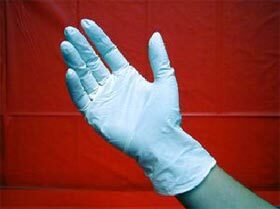 Gloves are certified free of RNase and DNase contamination. Produced specifically for use in nucleic acid research. Made of high quality nitrile. Fully textured surface for easier gripping of objects. Powder free to help reduce the risk of skin irritation. Certified to be free of all RNase and DNase contamination. Double bagged for additional contaminant protection. Serves as a reliable contaminant-free source for RNA work. 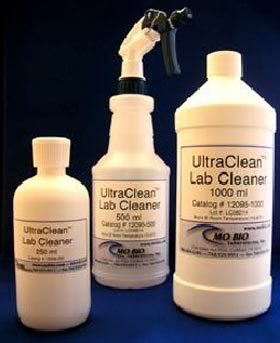 Surface cleaner to remove nuclease and nucleic acid contaminants. Efficiently removes nuclease (DNase and RNase) and nucleic acid (DNA and RNA) contamination. Easily decontaminates a variety of surfaces and labware. Perfect for pipettors, benchtops, glassware and more. Ideal for labware which cannot be autoclaved. Replaces time-consuming processes such as DEPC treatments. Easily wiped or rinsed away. Useful for RNA, DNA and PCR experiments.